To think Australians used to be so good at sledging. Now they can't even insult an Englishman without it going wrong. "Smug Pommie cheat!" roared the front page of the Brisbane Courier Mail on the morning of the first Test, over a huge picture of Stuart Broad glaring angrily. The assault continued inside - a list of "Broad's Seven Deadly Sins" so wicked that they included not the usual mere sloth or lust, but instead the sick depravity of retying one's shoelaces too slowly (you fear the fiery furnaces could get awfully crowded), plus the charming thoughts of a chap from Melbourne flogging commemorative T-shirts with the slogan "Never Forgive, Never Forget". "Broad has been on the receiving end of plenty of flak from the Aussie press and fans - some of it tongue-in-cheek, but a lot of it quite personal as well - so to be able to show the ball to the crowd having taken five wickets is a real triumph." "I started out with shirts protesting against Japanese whaling," said the entrepreneur, "and now I am protesting against Stuart Broad. I'm selling them in bundles of four because the demand has been so great." No matter that equating a bloke refusing to walk in a cricket match with the mechanical slaughter of vast aquatic mammals may be stretching things even for this punchiest of sporting rivalries. Down at the Gabbatoir, the slogans on display were spicier still. Asterisks would be required by the dozen to report them. When Broad was tossed the ball for the second over of the day, the boos were long and heartfelt. So too were the cheers when his first ball was first pulled to the fence by David Warner for four and then signalled a no-ball to boot. Broad, of course, was relishing every silly second. In his second over he found steep bounce to have the static Chris Rogers caught at gully, then returned before lunch to see off Shane Watson just as the chants labelling him a narcissistic self-abuser reached maximum volume at the aptly-named Vulture Street End. It kept coming. With the fourth ball of his first over after lunch, he had skipper Michael Clarke fending off feebly to short leg; 10 runs later, Warner slapped a short one down extra cover's throat. By the close of play he had bagged five prize scalps for only 65 runs, reducing the previously cocksure hosts to a meagre 273-8 despite a late afternoon rescue mission from Brad Haddin and Mitchell Johnson. All of which is a problem not only for Clarke's fragile side, who for all that bellicose pre-match talk appear to be no more robust under pressure than they were last summer, but also the tabloid that led the ill-judged assault in the first place. "Our newspaper coverage will simply refer to 'a 27-year-old English medium pace bowler'", the Courier Mail had proclaimed in the morning. Friday morning's headlines could be more interesting still. Someone with a little more insight should have warned them. You don't want to make Broad angry. You won't like him when he's angry. Some sportsmen crumple under sustained abuse. Others flourish. While Johnson's Ashes last time out were wrecked by that one repetitive song from the Barmy Army, Broad was never likely to follow suit. "In our medical assessments, our psychologists said three players would thrive on abuse: me, Matt Prior and Kevin Pietersen," he revealed afterwards. "I'm pleased my mum wasn't here. But I was singing along at one stage. I actually really enjoyed it." 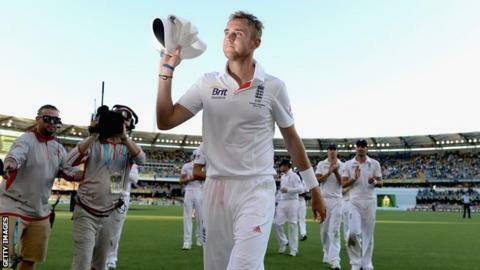 Broad has been in a sweet groove all tour, the pick of England's bowlers in the truncated warm-up matches. He is also in sustained form; he now has 50 Test wickets in the calendar year, more than any other man, and has gone past Andrew Flintoff in the list of his country's all-time Test wicket-takers. Then there is the effect the Ashes seems to have on him. The papers here might have labelled him "Stuart Fraud" for his return of just one wicket from the two Tests he played on the preceding tour down under, but - like his father before him - he now seems to reserve his best for this most important of contests. It was not always the case. After that famous 5-37 at the Oval in 2009 that did so much to win back the urn for England after the humiliations of 2006-07, he took just nine Aussie wickets in his next 11 Ashes innings at a cost of 60 runs apiece. That run came to an emphatic end with his match-winning figures of 11-117 in the fourth Test at Chester-le-Street in August. With his 11th five-wicket haul in Test cricket here on Thursday, he began his side's quest for a fourth consecutive Ashes series win in near-perfect fashion. It could have been even better. Without the partnership of 114 from Haddin and Johnson - a record for the seventh wicket in Ashes contests at this famous old field - Australia would have been up an unmentionable creek rather than merely under the pump. Haddin has previous. Three years ago, his unbeaten century here helped drag his side from 143-5 up past 400 and to a position from which they could not lose. Johnson - troubled, mercurial old Johnson - is rather more feast or famine. In 15 Test innings against England, he has now recorded five ducks and five half centuries. Such Gabba derring-do not only boosts his own fragile confidence for his primary task of rattling England out, but keeps his side in with a shout when before tea they appeared to have barely a sniff. Those late runs will have done a little to lift the mood of the troubled Clarke. Compared in another Australian paper after his pre-match press conference to the late Lou Reed for his "scowling passive aggression" (their words not mine) he endured anything but a perfect day on Thursday, his dismissal by Broad the sixth time in his last eight Test innings that he has fallen to that bowler. Broad walked into his own press conference after play with a satisfied grin on his face. In his hand was the Courier Mail's now infamous front page. Pommie? Every inch. Smug? Perhaps just a little. Catch up with a two-minute summary of Test Match Special commentary with Pint Sized Ashes. Look back on some of the key moments of the day's play with our photo album on the BBC Sport Facebook page.